Personality: Izokomyo is a man possessed of ambition. His soulful ambition can be described as one of fire. He abandoned his parents for what he considers their weakness and fear to pursue what he feels is his purpose. Izokomyo is fiercely loyal to those whom earn it, but due to the events in his past he is extremely suspicious and does not extend his trust easily. As his ambition drives him he is often seen as very serious as he sees his work as a shinobi as the path to his clan's revival. When he is not driving towards his goals he is very relaxed, calm, thoughtful, and quite lighthearted. This side of him tends to be kept to his closest friends and allies, because he is mistrustful of most. He is a caring person at heart, but suppresses his emotion when in pursuit of his goal, at times doing things he wishes he did not have to do and will later seclude himself in meditation as he laments the actions he felt he had to take. He is also not easy to anger, but when he loses his temper he becomes extremely reckless and ruthless. The betrayals of his past have instilled hatred inside him that he keeps bottled, when he is angered it explodes in a burst of rage. Likes: Izokomyo likes loyalty, in all forms: Loyalty to friends, family, village; everything. Izo values the virtue of loyalty as he holds himself to honor his commitments and has very little loyalty of others towards himself despite his want of companionship. He is a fan of strategy, particularly books on military strategy. He also loves to read in general as he feels all nature of knowledge will help him in his goals. His goal of reviving his clan through strength has also lead him to covet powerful techniques and actively seeks powerful jutsu in existence as well as creating his own. Dislikes: Izokomyo dislikes disloyal or prejudice individuals. He dislikes not being taken seriously and those who get in the way of his dreams. He also does not like snakes in general or bugs on his person. Not in a fear sense, he just doesn’t like them. Motivation: Izokomyo's motivations are to restore his family heritage to a position of respect and power. Ever since learning his family's history he has set his life's work to restoring his clan and making it one of the strongest in the world. The goals he has set for himself are to gain the trust of Hyougagakure and the Fubukikage by becoming a shinobi of the village, he wishes to become strong enough to pursue the title of Sage, and through these exploits gain the power and respect to begin building the foundation of what will become the Renyōso Ichizoku. Fears: Izokomyo fears failure. He is very hard on himself to never fail and is ashamed when he does not meet his own self-imposed high standards. His greatest fears are death and failing to restore his clan to their rightful place. He also fears losing those close to him. Betrayal has led the lowest points in Izo’s life and he is distant from people in fear of someone getting close and betraying him yet again. Bloodline Ability: Yōso Renkinjutsu. Using Renkinjutsu the user is able to meld different elements together in one jutsu to produce a new result or strengthen a technique. Examples of such uses are infusing a defensive earth dome with suiton; while the dome becomes mud instead of solid rock the new technique exchanges the longevity of a solid rock dome with a temporary mud dome with no weakness to raiton jutsu. Blending different elements together allows the Renyōso to gain a strategic advantage as it is difficult to discern their jutsu’s composition at first and it provides for a wide variety of combinations between techniques. While these unique infusions of chakra are used to supplement a jutsu's nature or effect they do not produce advanced elements. Physical Traits: Descendants of the Renyōso Ichizoku are extremely varied in their physical traits, as they commonly display reflections of their innate chakra blends; such as red hair for katon, dark hair or skin for doton, a lithe build for fuuton, blue eyes or hair for suiton, amongst other representations. All Renyōso have affinity for doton and as such express at least one trait representative of this element. Location: Scattered, first discovered descendant in ages is currently located in Hyougagakure. Clan History: During the days where Kazangakure, the Renyōso Ichizoku was a prominent clan of that powerful village. The Renyōso’s abilities were legendary at the time for the head of the clan’s ability to combine doton, katon, and suiton into a single jutsu. Doton and suiton would combine into a wave of mud to trap multiple targets, katon chakra would be infused with the mud causing it to harden. This would be followed up with a rapid infusion of katon chakra into the hardened rock causing it to explode. This brutal combination of jutsu gave the head of Renyōso, Kisaiujin a fearsome reputation. Their contributions to the height of Kazangakure’s power lead to their ichizoku’s success. They flourished under Kisaiujin’s power and leadership. Due to their fearsome reputation however, Kisaiujin’s bloodline was directly targeted leading up to and during Kazangakure’s destruction. Kisaiujin’s youngest son was killed by Shippuugakure shinobi prior to all out hostilities between the two villages. Kisaiujin’s eldest son fought alongside him during the siege of Kazangakure and both were slain during the fall. The order extended beyond Kisaiujin and his sons, as Shippuugakure feared a scattered Kazangakure could rally behind one of the Renyōso Ichizoku to challenge them again. Kisaiujin’s wife had died in childbirth with his daughter, Hanabi. Kisaiujin’s last remaining child was thought killed when their burning house collapsed around Hanabi. The young child however survived, managing to crawl out of that wreckage and run. Another young woman of Kazangakure picked Hanabi up as she fled the fallen village. The woman eventually adopted Hanabi and moved to a small farming village where she stayed with her cousins. Hanabi’s name was changed and raised as a simple farmer. Believing the Renyōso line was destroyed, there was no hunting for Hanabi and the Renyōso bloodline fell dormant in a small line of farmers. Eventually this line of farmers fell on hard times after several failed harvests, turning to hunting to sustain their needs. They migrated into Blizzard Country and became fur traders in a small town along the main route between Hyougagakure and Boufuugakure. History: Renyōso Ichizoku no Izokomyo was actually born to a different name and life. He was born Kazuki to a simple fur hunting family. He grew up in the cold tundra of Blizzard country living the normal life of a young boy slowly coming towards the age of where he would begin learning how to hunt like his father. What was to be a normal upbringing and normal hunting life was disrupted by his slowly developing abilities. It began when Izo was around five years of age, he would be able to manipulate the earth around him in small ways to benefit himself without really noticing at first what was happening. It manifested in small ways at first, raising the bank of the lake just slightly so he didn’t fall into the freezing water while playing near it, hardening deep mud as he ran across it. As time went on, he began to take notice of his unique ability to manipulate the earth and began trying to control his abilities in secret. He at first just practiced how he could manipulate the earth and eventually began using it to play pranks on other children by tripping them or moving things away from them when they weren’t looking. He still managed to keep this a secret until an incident occurred during his first hunting trip with his father. This first major issue came when he was eight, on the hunt of a snow leopard with his father for the first time. They had been tracking a leopard that had attacked some of the children playing in the forest and his father took him along as his first learning experience. As they tracked the leopard down, they cornered it near some large rock formations. As his father closed in towards it, distracted by explaining various hunting tactics to Izo a second leopard lunged out of nearby bushes at his father. Izo reached out his hand instinctively towards his father’s location, hands of mud springing from the ground and restraining the second leopard. His father turned quickly and stabbed the restrained leopard with his spear. The other leopard leapt forward to attack as well and again Izo restrained it with hands of mud from the ground. After his father finished that leopard as well, he turned and look at Izo who was almost as surprised as his father. His father was silent at first, returning home with Izo without uttering a sound besides a warning to not speak about this to anyone. The following day his father took him aside and explained to him that he should never do that again, that it’s dangerous for himself and his family if anyone were to know. He threatened him, told him that their family’s blood was a curse that had to be suppressed at all costs. Through the stubborn determination of a curious child he was able to at least learn that his true family name is Renyōso. From this he learned over time from the elders of their small town that the Renyōso Ichizoku is an old destroyed clan from Kazangakure with a powerful kekkei genkai; no one currently known alive whom possess it since the village’s fall. Izo had oft dreamed of becoming a renowned hero, a fabled samurai, or a legendary shinobi; this fallen ichizoku he has learned he was part of just attached itself to his desire. As he grew, Izo continued to work on his talents in secret, reading any books he could, taking as many trips into the main village in order to watch the shinobi. He often got into trouble for attempting to sneak into the academy in order to study what they stored there. By the time Izo was fourteen, he was in full rebellion of his father’s desires which caused tension and commonly turned into arguments and fights between the two. His mother often did not understand her husband’s vehement protests to Izo’s curiosity, her father having been a shinobi of Hyougagakure. One of their fights began to get out of hand, Izo completely frustrated with his father’s sanctions against his studying ninjutsu and his father’s fear tied into his own exasperation. Izo was attempting to leave and his father blocked his path, each yelling at the other. Izo attempted to push past his father, his father responding by striking him upside his head. In his anger Izo struck back, getting into a fist fight with his father despite being at a significant advantage; a fourteen year old boy against a much bigger, stronger man in his prime. After being hit a few times Izo fell back, his father moving towards him. He pushed himself back while still on the ground a few times, his father pushing his mother off as she tried to stop him. He again reacted without thinking, he reached out his arm towards his father and two arms of mud burst through the floor, grabbing his father’s ankles. There was a loud audible pop as he father yelled in pain and fell to the floor, smacking his head on a chair. After his brief moment of shock Izo took flight out into the forest and didn’t look back. He wandered for some time, stopping briefly in a few towns he knew of from travelling with his father selling furs. He borrowed some supplies on credit to his father to continue along, all the time telling himself it was his father’s fault for betraying their heritage, for holding him back and ruining his life. He remembered the fear in his mother’s eyes, telling himself she betrayed him for not understanding. As he made his way, fleeing from his parents destined for Boufuugakure he heard sounds in the distance while on the outskirts of Blizzard country. As he drew close, he realized the noises were a fight between shinobi. He couldn’t really follow all of what was going on, but he continued to watch out of an insatiable curiosity. As the fight came towards its end, it came closer and closer to his position. A shinobi dressed in black and white versus a shinobi in red and black, the one in red and black appearing to have the upper hand now. Both shinobi completed quick hand seal combos, unleashing a jutsu upon each other. The shinobi in white made a final loud grunt and fell, the one in red seemed dazed but was still on his feet. The fallen shinobi in white’s technique created a shockwave and bright flash, causing Izo to fall backwards and yell. The shinobi in red pursued his shout, and aggressively approached Izo as he lay on the ground. Izo was frightened as the red shinobi brandished a ninjato at him, asking him who he was. Too frightened to listen, he panicked when the shinobi pointed the ninjato at him; throwing his arm up and the earth reacted. A single spike of rock struck forth from the ground and into the shinobi. The unknown shinobi made a small noise in surprise and before lurching forward, the rock spike lodged in his chest. Crimson flowed and stained the white snow around him. Izo almost sighed in relief, when he realized there were several other shinobi in red around him. At first he was stunned and afraid, he then grabbed for the deceased shinobi’s ninjato, taking a defensive guard that he had seen some Hyougagakure shinobi take while training. This drew a bellowing laugh from an older man with voluminous black hair; he stood above six foot tall, very muscular with a red star tattoo on his left upper arm. 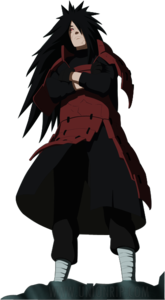 He dressed differently from the other shinobi, all of which were mostly covered in red and black. He wore a red accented black vest that left his arms exposed, with black armguards and pants. His voluminous black hair pulled back with a forehead protector. This man turned out to be the leader of that shinobi group, of which took Izo with them despite him having killed one of their own. The leader took interest in Izo’s strange kekkei genkai and decided he wished to see exactly what it was capable of. If it was worth something to them, they would keep him alive. When asked his name he hesitated, he didn't believe his given name applied to him any longer. 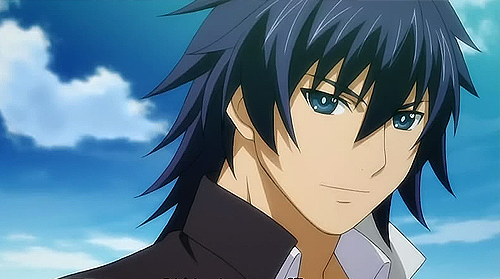 He instead opted to give himself the name Renyōso ichizoku no Izokomyo or Izokomyo of the Renyōso Clan. Izo came to know the man as Akarīdā, who convinced Izo that he was the leader of special ANBU unit for Hyougagakure who carried out special missions. He believed Akarīdā, being young and naïve. He desperately wanted to be a part of something, he couldn’t wait for training, and he craved being accepted; to feel like he had purpose. Akarīdā mentored Izo mostly in private away from the rest of the unit, allowing Izo only to spar with the others on occasion and always under his supervision. Izo was slightly suspicious of this, but he was so focused on learning the art of the shinobi from Akarīdā that he didn’t expend much thought towards it. Training went on for several years, Izo travelling with Akarīdā, training daily no matter where they travelled. Even when Akarīdā would disappear for a mission Izo had to train in his absence, Akarīdā always knowing if Izo attempted to slack or get distracted by events whatever town they found themselves near. Akarīdā focused on helping him develop around his innate strengths using doton and suiton jutsu, pressing him from time to time in order to help develop control over his unique kekkei genkai. Izo kept the first ninjato he received, the one he took from the red shinobi he killed, focusing on kenjutsu as his preferred method of combat. He focused initially on fighting with ninjato supplemented by ninjutsu. By the time he was sixteen Akarīdā began forcing him into complementing his kenjutsu with taijutsu, telling him that one should never rely on always having access to their choice tools. After Izo’s eighteenth birthday passed, he began getting more and more impatient with Akarīdā. After four years of training, having sparred with and beaten many of Akarīdā’s subordinates he felt he was ready to begin taking on missions with the rest of the unit. Akarīdā kept making excuses, sometimes he wasn’t strong enough, eventually that the Kage needs to approve, that he would need to meet with them in Hyougagakure but they didn’t have the time right now to set up a meeting for whatever reason. Repeatedly he tried to shadow Akarīdā or sneak out to follow one of the other members when they would go on mission. Always he was caught and returned to the compound. Near his nineteenth birthday his life would take a sharp turn yet again. They were in their main camp in the mountains of Blizzard country. Akarīdā had been increasingly at odds with his lieutenants. Izo was adept enough now to get in close enough to hear parts of their arguments. They accused Akarīdā of going soft, coddling Izo by still not having him go on missions with the unit. They said never before and never since Izo had any members not been immediately initiated into the unit. That Akarīdā had been taking even less lucrative contracts in recent years, almost outright calling him fearful and a coward. They would rarely do anything but argue and would retreat when Akarīdā got angry, but they were becoming more forceful lately. One day Akarīdā took his lieutenants and a new member he was suspicious of out on a ‘mission’, where they intended to interrogate him for being a spy. Izo figured that the young man was a spy from another village, trying to infiltrate Akarīdā’s ANBU unit. After the second day began drawing towards night, Izo became suspicious but as he was beginning to ask around their camp came under attack. Shinobi bearing the forehead protectors of Hyougagakure appeared out of nowhere, barraging their camp from the surrounding area. The attack was extremely effective at first, catching them by surprise and temporarily without a leader. Izo survived the initial assault utilizing his Renkinjutsu: Maddodōmu to shield himself. A large portion were killed before being able to grasp the situation, the more talented shinobi among them began retaliating, but most alive were trying to just fight their way out. They had a rally point for such an occasion, Izo immediately made for the nearest escape into the forest. He made it to the forest without expending much effort due to being amongst a group of his allies who cleared the path for him. As they entered the forest they came under attack from a group of long range Hyougagakure shinobi, scattering the group he was with. Izo managed to dodge behind a tree then used a suiton mist jutsu to conceal his position in order to escape and provide cover for his allies. Izo stared at the enemy-nin, lowering his guard slightly. The oddities of his fellow ‘comrades’, of how he was treated, the lieutenant’s comments, Akarīdā’s stubborn refusal to initiate Izo and allow him on missions despite no precedent of similar treatment, everything came rushing into his mind at that moment. The enemy-nin lowered his stance, looking closer at him. “You don’t have the branding, do you? You were never initiated.” Izo stared back, “No. Much to the contempt of the others and myself, Akarīdā trained me but did not let me take any missions.” The shinobi stared back briefly then nodded, “Very well, I am Mitsunari Akemi an actual Jounin of Hyougagakure. If what you say is true I am not your enemy and your ‘friends’ are not who they say they are. You seem to believe that what I say could be correct. If you do I suggest you come with me unless you wish to die with the rest of them. They are all condemned to death, disgraced shinobi killers.” Everything going through Izo’s mind had him reeling, worse even than the kick he suffered earlier. He couldn’t believe it, he can’t. They were ANBU, doing the bidding of Hyouga, there must be some mistake.. Or is there? There was enough to cause him to doubt, he ignored every bit of it. Akarīdā told him though, his sensei, the man he accepted as his adopted father. He couldn’t believe him. “No.. I.. How.. I have to find Akarīdā.” With that Izo turned and leapt high into a tree, running as fast as he could through the branches of the forest in the direction he was told Akarīdā went in before the attack. After a distance Izo found traces of a long, moving battle separate from the now burning camp. At first he discovered the bodies of two of Akarīdā’s three lieutenants, apparently having killed each other. A short distance later he found two dead shinobi wearing Hyouga forehead protectors and the third lieutenant. In the final area, still charred and burning from the fight were three more Hyouga ninja and a bloody Akarīdā prostrate on the ground, crawling out of a crater. Izo rushed over to him, turning him onto his back. “Akarīdā! What happened? Why? What is going on?” A clearly broken Akarīdā looked up at Izo, blood leaking from his mouth. Akarīdā eyes looked to the left away, he couldn’t look at Izo. Izo whom he trained and bought fully into the lie that he was the leader of a secret ANBU unit. Akarīdā explained to Izo that the day they found him lost in the forest, his group of mercenaries were carrying out a contract from another village on a trio of Hyouga ANBU. That he intended to mold Izo into a powerful weapon for him to use. A powerful weapon to kill their enemies, a weapon to be used. Used, Izo thought to himself. Used. He felt betrayed again. His world came crashing down just as the time when he fought with his father and fled that life, again he was betrayed and alone. Akarīdā never got to explain the reason Izo was never allowed on a mission. He never spoke the words or even admitted to himself that while he took Izo in as a tool, he grew to become something more. A replacement of a family, a son he lost years back leading to his desertion and founding of the mercenary company. Izo still lives feeling betrayed and used. Mitsunari Akemi had followed Izo and approached him again. He again offered to bring Izo in, to get him cleared of any charges leveraged against him, and possibly to find himself a village being that he believes Izo had potential to help Hyougagakure. Still confused, shocked, angered, feeling broken, and with nowhere else to go Izo accepted the offer to travel with Akemi if only to clear his name. While silently travelling back to Hyouga in hopes of clearing his name he gained new motivation. His name, HIS; he had to clear HIS name. It had been so long he had nearly forgotten the significance of the new identity he gave himself. Renyōso ichizoku no Izokomyo, he was the only known blood descendant of the Renyōso Clan. He made a silent oath to himself while travelling that he would do whatever it takes, he would become powerful. He had to; he was again dedicated to restoring the Renyōso ichizoku and establishing it as one of the most powerful to exist, even if he was not accepted in Hyouga he would succeed. With no branding, accounts of captured Reddosutā Yōhei, and Mitsunari Akemi’s vouching Izo was cleared of involvement with the Reddosutā Yōhei due to never having committed a crime. Izo spent the next year continuing his studies partially on his own and occasionally with Akemi’s assistance. He helped the townsfolk of Hyougagakure doing deliveries, heavy lifting, and hunting in order to make a living while he worked towards approval from the Fubukikage to work as a shinobi of Hyouga. He used any extra ryo he earned from his random jobs to pay for one on one lessons from the academy teachers to prove his humble dedication and prove his skill as a shinobi. He also applied to participate in the Chuunin exams as both himself and Mitsunari Akemi pushed for being granted rank of Special Jounin due to his elevated skill level. Izo spends most of his time working to support himself, training hard to get stronger, and meditating. After the incident with Akarīdā and his death, Izo found motivation in the revival of his clan, but still felt broken. He often worked silently, even though he maintained a very kind and respectful visage. His closest bond was his occasional training sessions with Akemi. Other than that he had great relationships with townsfolk and shopkeepers he helped, but nothing more than a friendly working relationship. Izo managed to find solace in meditation to calm the negative feelings raging inside of him. He had trouble at times with his temper, having exploded numerous times during his solo training. He would rage against himself at times when he was down and failing to meet his training expectations. This caused his training materials to become damaged, costing him more ryo he didn’t have. Through meditation he has managed to get his feelings under control when not antagonized to an extreme degree. After the initial flurry everyone was still. Poised and ready in fighting stance, but everything was eerily calm. He ran his hand through his pitch black hair, now smattered with blood and dirt. “It comes to this, does it?” he thought to himself. A veteran of many battles his mind remains calm and clear, reviewing quickly what had just transpired in the chaotic spat. He had been too careless not to notice the signs, too caught up when to tell the boy the truth that he neglected his responsibility as leader. “That boy..” “NO!”, he thought. He can’t lose focus. In the short few seconds that transpired he had killed the young spy, however he hadn’t anticipated his own lieutenant to be one as well. About him lay the bodies of a young man killed by his own hand and two of his lieutenants, clutching each other forever in a grip of death each other’s blades in the chest of the other. He took a deep breath, analyzing the situation. His only ally left he knew to be an extremely adept raiton user. Two of the enemy-nin used doton and three suiton. He took note of their used jutsu, analyzed their stance to look for inexperience or vulnerabilities he could exploit, and planned his next move. “Well, we can’t just stare at each other forever. I have some avenging to do.” He thought to himself. He decided to act first giving a quick signal to his ally to move, then leapt diagonally backward performing quick series of handseals. He then releases a cloud of chakra infused black power into the area where the enemy-nin still stood. “Katon: Haisenkisho!” he said after blinding anyone caught in the ash and igniting it, the whole area erupting quickly in flames. He lands down a distance away, poised ready for their counter attack. “Hmm, fast.” He thinks to himself as he watches all five enemy-nin dodge his burning ash jutsu. He steps back quickly with his left leg, bending it down like a coil ready to react as one of the suiton enemy-nin closes in from his side. Before he can move he watches as an arc of lightning crackles through the enemy-nin’s body, originating from his ally who followed his signal and moved with him. His eyes were open, knowing to expect the enemy-nin’s allies to be close behind he watched as the two earth users came upon his ally at the same time. Fists covered and supplemented by jagged rock formations they attacked him from both sides. Thinking fast to cover his ally he performs a quick series of hand seals, placing his hands on the ground. From his hands come two lines of thick mud that extend out towards his ally on either side of him. These four foot wide lines of mud multiply on top of themselves leaving behind a wall of mud twenty feet high, right in the attack path of both enemy-nin. I hope it was okay to do an RP sample based around a character and fight in my history. It was fresh in my mind and thought it to be fun to at least write up a portion of the mentioned fight from Akarīdā's perspective. I have made edits to my character in order to reflect the change in clan.